If by his life or his death he can protect those keen to star in Amazon's upcoming Lord of the Rings television series, Viggo Mortensen will. Chatting with Collider's Perri Nemiroff to promote his upcoming comedy-drama Green Book, Mortensen, who portrayed Aragorn in the Lord of the Rings film franchise, offered words of wisdom to any actors interested in joining the Amazon adaptation — particularly the person who lands the role of the man who ultimately becomes the King of Gondor, since the series is said to focus on a young Aragorn. Mortensen's biggest piece of advice? Get familiar with the source material, the Lord of the Rings novels written by J.R.R. Tolkien, and read up on the tales from which Tolkien took inspiration for his classic high fantasy works. "I would say, not only read the book, you know, very thoroughly, that giant book of Lord of the Rings, but you could read some of the Nordic sagas. You'll get some clues there as to where Tolkien got his information. Like, Sigurd the Dragon Slayer, and the Volsunga saga. Read that," said Mortensen. "Lord of the Rings was a case where I replaced an actor and they were already filming — not only filming, but they'd been rehearsing for months and learning all these skills they had to have for those movies — language skills, invented the Elvish, and swordplay, and horse riding, all this stuff. And I was kind of freaked out because I said 'yeah' and I'm on the plane, on this 13-hour plane flight, and I'm looking at the book, which I had never read. But as I started looking at it, I was like, 'Well, there's something.' There's always something that you can draw on," said Mortensen. "I had read or been read to as a kid, stories about Vikings and Nordic sagas and stuff, and there was something there that was familiar." Brushing up on the Lord of the Rings books and learning all there is to know about Nordic tales aren't the only things Mortensen believes aspiring Lord of the Rings actors should do. Mortensen also told Collider that he thinks hopefuls should watch films by legendary director Akira Kurosawa. (He didn't get into specifics, but Kurosawa's most popular works include Sanshiro Sugata, Drunken Angel, Seven Samurai, Yojimbo, Ikiru, No Regrets for Our Youth, Rashomon, Scandal, Ran, and Throne of Blood. Those are just the tip of the Kurosawa iceberg, though.) Why? Mortensen didn't say, but we have a feeling it has something to do with all the high-stakes action sequences. 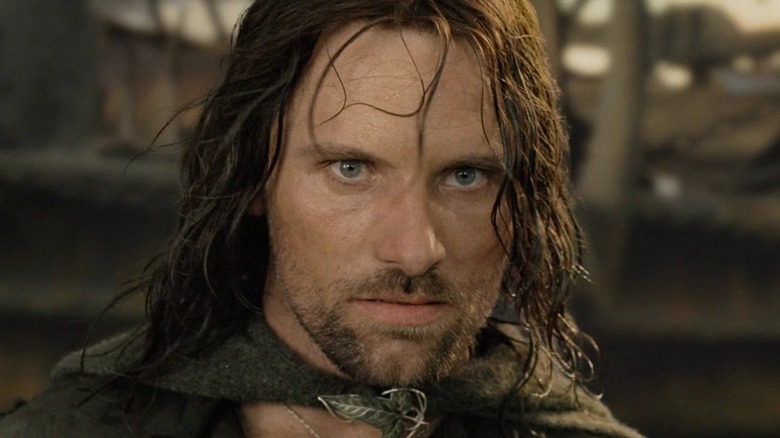 Should the Lord of the Rings series actually center on Aragorn in his early years — and take place in a time set ahead of the events of The Fellowship of the Rings — the actor who takes on the coveted role will undoubtedly have at least one meeting with Mortensen. But long before that ever happens, Amazon has a ton of tasks to see through — starting with finishing the script, penned by J.D. Payne and Patrick McKay. With any luck, once Payne and McKay finalize the story and Amazon begins rounding out the series' cast, Mortensen will approve of the actor who will follow in his footsteps. The current belief is that the Lord of the Rings series will arrive sometime in 2021.